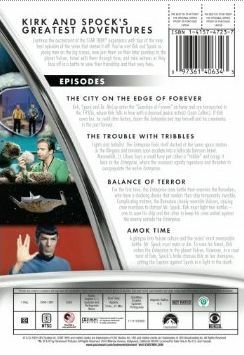 The first episode on The Original Series disc is titled The City On The Edge of Forever , and actually takes place primarily on Earth in the 1930s. It starts off on the starship Enterprise, where the ship is investigating a temporal disturbance on the surface of the planet. For some reason a console explodes in front of Sulu, injuring him and thus causing Dr. McCoy to give him some kind of risky medicine. This becomes important because a few moments later the ship is shaken which causes McCoy to accidentally inject himself with a large dose of that medicine, thus making the man insane. He escapes the bridge, beams down to the planet, and eventually jumps though a giant rock-like circle which happens to be some sort of time portal. Afterwards, the entire Enterprise dissappears, leading Kirk to believe that McCoy somehow altered time such that the Federation never existed. Thus, Kirk and Spock make the decision to follow him, timing their jump through the portal such that they arrive in the past prior to McCoy by about a week or so. Now in the past, the two try to blend in while Spock attempts to build some device to read information off the device he brought with him and Kirk begins to fall in love with a pretty female anti-war social worker. Turns out, this social worker is the key to the change in history... but is she supposed to live or die to make things right? The next episode is The Trouble with Tribbles , which is probably one of the most famous episodes, even among non-fans of the show. This is the one with the cute little furball creature that multiplies and multiplies until the little guys are all over the ship and space station. The tribbles are actually the subplot here, with the main plot focusing on a competition of sorts between the Federation and the Klingons. You see, there's this planet which is in disputed space, and due to some treaty it will be awarded to whomever shows that they can manage it best. I didn't really get how the whole competition thing was supposed to work out, but I loved the demeanor of Kirk in this episode, and of course the cute little tribbles. Balance of Terror is up next, and marks the first appearance of the Romulans. Along the border of the neutral zone next to Romulan space, several Federations outposts are being wiped out, so the Enterprise is sent to investigate. What they find is a Romulan ship with new technologies, one of which allows them to become invisible. This is basically the cloaking device that we all come to admire. The other is an extremely powerful weapon. The meat of the episode, however, please like a cat-and-mouse game between submarines, with each captain trying to out think the other. This makes for some very tense moments, which are skillfully done. Finally we have Amok Time , a very character driven episode. No space battles or anything like that. Here the focus is on Spock, who is acting extremely out of character for some reason that he will not explain. He requests shore leave on planet Vulcan, which Captain Kirk approves, but unfortunately some big wig decides they want to change their schedule and Kirk is ordered to alter course... but if Spock doesn't get to Vulcan in time, he will die. Not a hard choice for Kirk to make, his career or his friend's life. I think this goes far in showing Kirk's true character, but there is even more which shows up later on. Definitely a well-crafted character-centric episode. That's it for the episodes, and there are no DVD extra features aside from a preview, so that was a bit disappointing. A commentary or something would have been really nice. The quality of the video is pretty damn good for a show made back in the 1960s. Of course, these are the remastered versions with enhanced special effects and sound. If you have not seen this remastered episodes yet, I would recommend it. 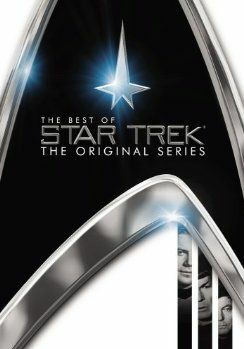 Heck, I would recommend it anyway just because they're great episodes.